Don’t let careless mistakes leave you in dark. 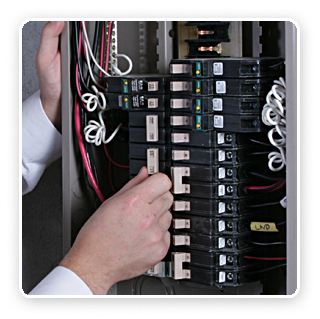 Call Your Scottsdale Electricians to get your Scottsdale Breaker Service and repair. We are so confident in our services that if any complication arrives from your breaker box till 3 years after we have put in our installation services, we will repair your system for free. Our trained and professional electricians are committed to provide 100% customer satisfaction. Moreover if you have an old breaker box in your house, it is better to get it replaced rather than waiting for a potential hazard to occur. We will schedule a breaker box inspection free of cost to determine if you have a one that needs to be replaced. Don’t wait until your old breaker box catches fire, call us to get your Scottsdale breaker box service and repair now. It is better to be safe than sorry. You no longer need to wait for weeks only for an electrician to show up at your house, or to fetch up additional electrical equipment’s that add up to one giant services bill. Your Scottsdale Electricians arrive with their truck stocked with premium electrical breaker box parts to ensure efficiency of your Scottsdale breaker box installation service and repair. Moreover as an added bonus, if we arrive late for our scheduled appointment, we will gladly perform the after sale or repair service for free. The Scottsdale breaker box service and repair is completed by our highly trained certified professional electricians because we understand the importance of professionalism in doing such a critical and important job that if performed improperly can be dangerous. We perform exceptional services all thanks to the excellence of our technical skills. Our polite and friendly conduct, as well as professionalism, ensures that we have a long-term relationship with our client not just that of doing business.